Allows to market same product with different look for different listings, customer groups or even marketplaces like Amazon and Ebay and have precise control over inventory level. You have some inventory in your warehouse with known stock levels. And you'd like to trade it everywhere: through your Magento stores, through multiple external marketplaces (like Amazon and eBay), even list the same product under multiple items of the same marketplace. 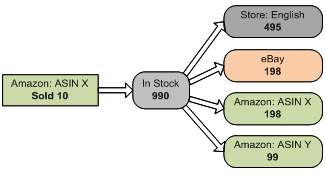 So you set up rules how overall stock level is distributed across each store, external marketplace and listing. (out of this extension's scope) Optionally, you set up various data exchange links to minimize manual labor. Update stock level from backend ERP or WMS system you have. Update external marketplaces with stock levels designated to them and receive sales information back. Each sale is registered against real product inventory and then it is redistributed to internal and external stores according to already set up rules. When stock runs low, replenish. Whenever physycal inventory stock level changes, internal and external quantities get updated too. Suppose you sell some bed with SKU BED and have 100 items in stock. Also suppose you have 2 customer groups, RETAIL and WHOLESALE. Finally suppose you have already implemented a change in Magento catalog allowing to hide certain products from specified customer groups. Make BED not visible individually. Create two clones of the product with SKU BED_RETAIL and BED_WHOLESALE. Make sure that retail customers only see BED_RETAIL product and wholesale customers only see BED_WHOLESALE product. Finally, prepare BED_RETAIL descriptions, pricing, images, etc in a way you’d like your retail customers will see it. Do the same with BED_WHOLESALE product. You will get orders from retail customers with BED_RETAIL product and orders from wholesale customers with BED_WHOLESALE product. With every order, the stock of BED product will decrease. When you get new bed into stock, modify inventory level in BED product and both BED_RETAIL and BED_WHOLESALE products will be updated. Alternatively, you can create only one additional product, lets say for wholesale customers, and leave BED product visible only for retail customers. In this case BED stock will still change from its own sales and from BED_WHOLESALE sales and replenishments of BED stock will still be distributed to BED_WHOLESALE as well. Suppose you sell some camera with SKU CAMERA and have 100 items in stock. Also suppose you have 2 listings you’d like to put it to, X_CAMERA and Y_CAMERA. 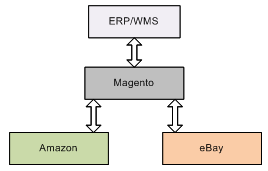 Finally suppose you have already implemented a change in Magento allowing you to keep both catalog and orders in sync. Make CAMERA not visible individually. 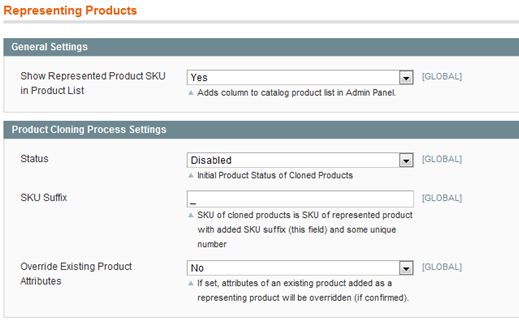 Create two clones of the product with SKU CAMERA_X and CAMERA_Y. Assign ASIN’s to both products. You will get orders with both CAMERA_X and CAMERA_Y products. With every order, the stock of CAMERA product will decrease. When you get new cameras into stock, modify inventory level in CAMERA product and both CAMERA_X and CAMERA_Y products will be updated. Again, there is an alternative setup where only one additional product is created and original product participates in sales directly. Easy and fast creation of product's representation for each marketplace, each marketplace item. Convenient setup of rules how physical inventory stock level is distributed across marketplace items. 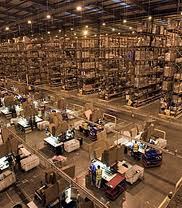 Automated control that physical quantity in stock=total of quantity in each marketplace. 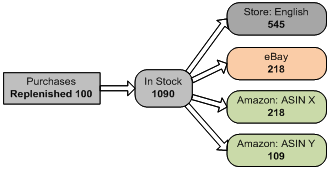 Automated control of out-of-stock condition. Automated physical quantity adjustment on sale or return of any associated marketplace items. 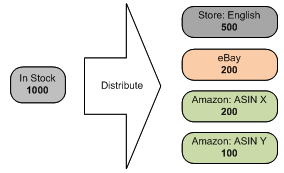 Automated redistribution of physical quantity to marketplace items on each sale, return or replenishment. Easily integrated with import-export engines. I have this extension. 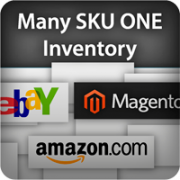 It has allowed me to sell my items on Amazon across ALL the ASIN that are listed for that item. It has increased sales by 20 - 30 present as I also never have to worry about stock levels on each items as this add on handles it all. it also allows me to set qty % to a better selling ASIN. I can assign more stock to the better selling listing as to insure that the second listing will also have stock. What the extension does do is excellent - the interface is intuitive and functions flawlessly. Inventory can be split up between products via parts per whole, percentage, or exact quantity. Shared inventory quantity for each product is calculated automatically in an extremely user friendly way. However the main extension icon, the Overview description, and the review prior to mine are misleading. There is no built in Amazon or eBay integration. An additional extension/service is required to do so. Exactly we needed Very powerful unique Extension, Does Exactly as described!